The EU referendum campaign is going to get ‘nasty’, promised those pushing for Britain to leave the EU. 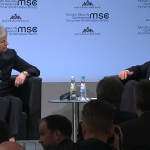 In a taste of what’s to come, two Eurosceptic students interrupted a speech by Prime Minister, David Cameron, at a CBI conference yesterday, yelling, “CBI! Voice of Brussels”. The two students who disrupted the Prime Minister’s speech obtained passes to the conference by setting up a fake company and website, reported The Telegraph. The CBI has repeatedly been a target of Eurosceptics because they undertake paid research for the European Union. But the CBI robustly rejected the allegations. 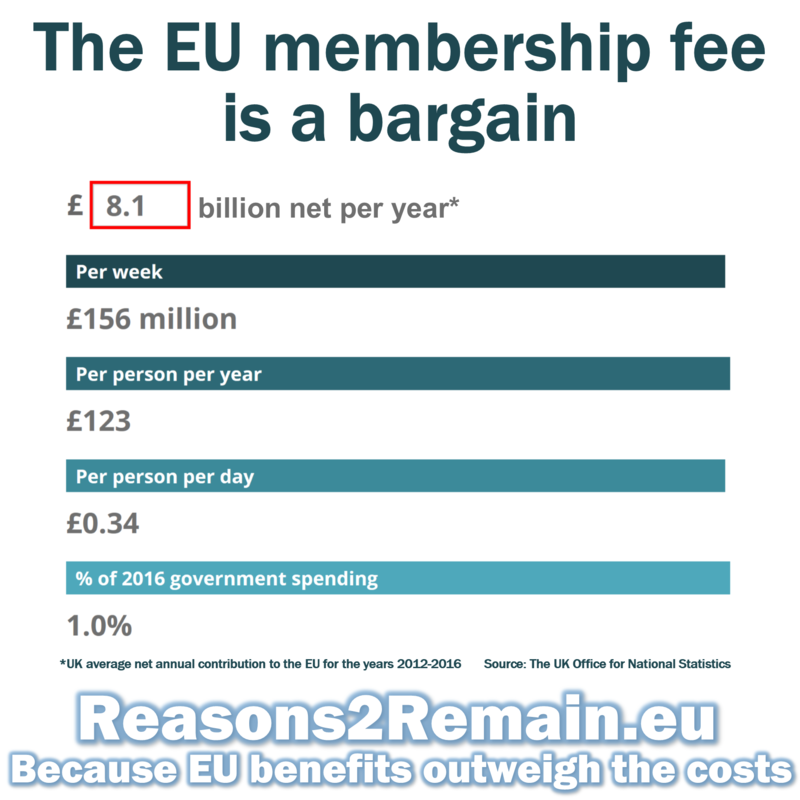 Rain Newton-Smith, the CBI’s Director of Economics, added that the organisation competitively tenders to provide the EU with economic data and that this represented just 0.6% of the CBI’s total annual income. She told me, “The CBI is under no obligation to promote the EU. We speak on behalf of our 190,000 members who employ nearly 7 million people and while the majority wish to remain within a reformed EU, we do not shy away from criticising aspects of European legislation where necessary. According to the latest opinion polls, Britain is split right down the middle on whether the country should remain a member of the European Union or leave. A poll by Survation for the Daily Mail this autumn revealed that the electorate was 51/49 against Britain’s continued membership of the EU. 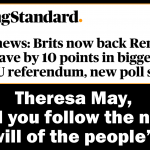 The poll revealed a stark difference to a poll by Ipso Mori at the beginning of the summer, which claimed that 75% of British people were in favour of Britain’s continued membership of the EU, with only 25% wanting to leave. That’s all now changed, according to some commentators, because of Europe’s mishandling of the refugee crisis. The new poll revealed that if the “current migration crisis gets worse”, 22% of those wanting Britain to ‘Remain’ in the EU might switch to the ‘Leave’ campaign. So there is everything to play for by both sides of the campaign. If the new poll is right, neither side currently has enough support for a decisive win, so both sides will have to work harder. No wonder things are getting desperate. But is ‘getting nasty’ the way to win hearts and minds, and most importantly, votes? Wouldn’t a more calm, considered and edifying debate, where both sides listen carefully and politely to both sides of the argument, be in the best interests of the country? After all, whether Britain remains in the EU or leaves, we’ll all still have to live with each other after the referendum result is announced. So wouldn’t it be better for the referendum campaign to be civil, rather than to become a civil war? 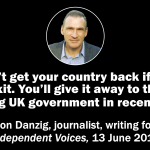 This entry was posted in Current Affairs, Democracy & Citizenship, Economics & Trade, Media & Communications, Politics & Public Policy, Society & Culture, The EU and tagged CBI, Dominic Cummings, EU referendum, eurosceptics, vote.leave. Bookmark the permalink. Next: Does the Prime Minister know what he’s doing? The reason the CBI is under fire from those who wish to see a Brexit is very simple. The research and subsequent data provided by the CBI is slanted and is not carried out in a manner that reflects its ‘membership’. 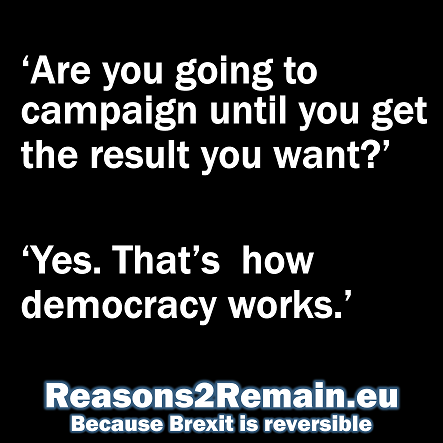 If the CBI wishes to use the more than one million GBP it has received from the EU commission to carry out an independent poll of its ‘membership’ then I would personally accept the result, but I very much doubt the CBI would. During the debate on the Euro replacing the Pound the CBI came up with equally spurious research suggesting that it’s ‘members’ were wholeheartedly behind Euro replacement. Of course this was not the case, and the CBI wishes to not remember that they were wrong then, and wrong now. The whole issue of ‘membership’ is also extremely odd, I ran a successful business in London for two decades, I never applied for membership, never received any information from the CBI, yet I and my employees became members and no doubt were part of their EU funded propaganda. 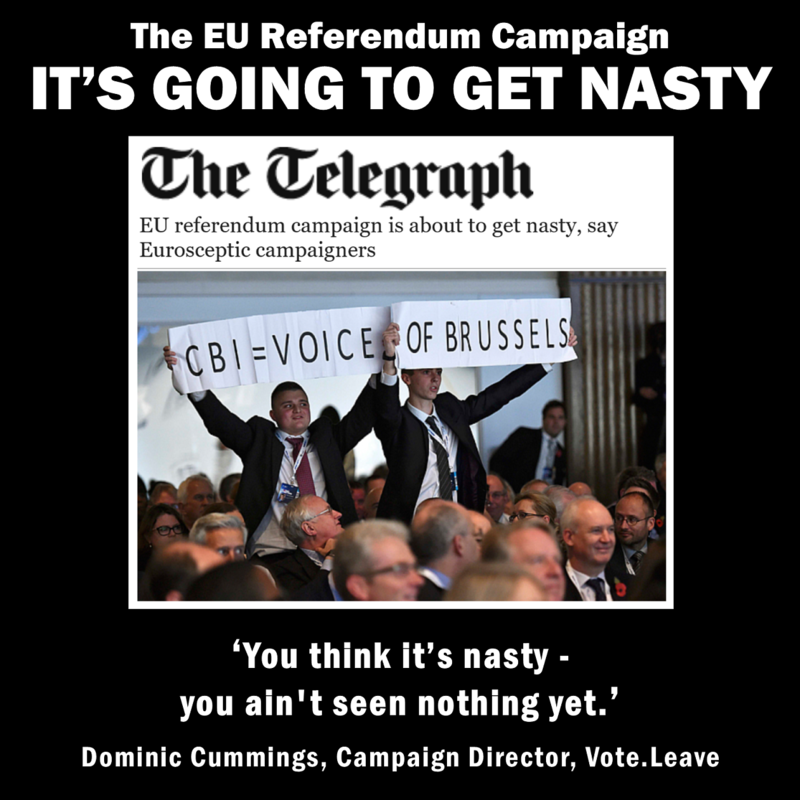 Will this referendum get nasty? That depends very much how you perceive nastiness I guess, it will be passionate, because it’s very important, and those that wish to preserve our status within the failing EU had better get used to that. In other news a bear was seen entering the forest with a toilet roll in its paw Jon. Why doesn’t it ballot its members then? It has received more than one million pounds from the EU, so it has the funds. Other institutions for the representation of business interest are, why doesn’t the CBI? The CBI has no credibility in this debate, if it actually polled its members that issue could easily be resolved. It won’t though, why Jon? I should add I cannot find any evidence that the CBI is beholden to the European Union. In fact, I have sometimes been disappointed that the CBI has strongly criticised the European Union when I have considered that such criticisms were not warranted. UKIP receives millions of pounds in income from the European Union; much more than the CBI. Does that make UKIP a supporter of the EU? Actually, quite the opposite. Nick Moon of the British Polling Council appears to think differently. We know this as he inadvertently hit reply all on a recent email. He wrote: ‘Bugger – at first glance the odious Cummings might be onto something. CBI has history in this regard, they were correctly overhauled for the same sampled polling during the Scottish Independence Referendum, and muzzled after their own members started resigning. More than 99% of their claimed ‘membership’ employ less than 50 employees, a reflection of British business as a whole, yet only 20% of those polled fell into this category. The new Chair may change things, I won’t be holding my breath.